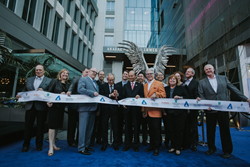 Embassy Suites by Hilton, a global brand of upscale, all-suite hotels from Hilton (NYSE: HLT), announced today the opening of a new hotel located in Pioneer Square, Seattle’s first neighborhood. “Our downtown Seattle property offers added value and is conveniently located to serve business travelers and families alike,” said Keith Buck, general manager, Embassy Suites by Hilton Downtown Seattle Pioneer Square. Embassy Suites by Hilton, a global brand of upscale, all-suite hotels from Hilton (NYSE: HLT), announced today the opening of a new hotel located in Pioneer Square, Seattle’s first neighborhood. Embassy Suites by Hilton prides itself on offering guests an approachable and stress-free experience at each of its hotel properties. The bright and modern Embassy Suites by Hilton Seattle Downtown Pioneer Square is conveniently located near all attractions the city is known for, including Pike Place Market, Pier 55 and the Seattle Art Museum. With its close proximity to CenturyLink Field and Safeco Field, guests are a short walk away to various sporting events. The hotel is also located next to King Street Station off I-5 and just a mile from ferry terminal, Pier 91, making it an ideal Northwest hub. Owned by American Life and managed by Hilton, this upscale hotel is a 282 all-suite property consisting of two-room suites and studio suites with panoramic views of Seattle and Elliott Bay. The hotel is comprised of two glass towers, one housing the main lobby and hotel amenities as well as guest rooms and suites above. The other houses the 7,433 square feet King Street Ballroom, one of the largest and most flexible ballrooms in downtown Seattle, an outdoor event terrace, indoor pool and leased office space. Guests staying at the Embassy Suites by Hilton Seattle Downtown Pioneer Square can enjoy a free made-to-order breakfast in the morning and complimentary drinks and appetizers daily at the Evening Reception. They can also taste Northwest food and drink favorites in the Zephyr Bar, located in the lobby. Additional amenities include a health club with an indoor pool, exercise room and sun deck, six-story atrium lobby, upper work loft and outdoor courtyard. Each room is also equipped with an HDTV, wet bar, refrigerator, microwave and complimentary Wi-Fi. Embassy Suites by Hilton Seattle Downtown Pioneer Square participates in the Hilton Honors® loyalty program, which is open to all guests and free to join - visit here for enrollment information. Hilton Honors members who book directly through preferred Hilton channels have access to instant benefits, including a flexible payment slider that allows members to choose nearly any combination of Points and money to book a stay, an exclusive member discount, free standard Wi-Fi, as well as digital amenities that are available exclusively through the industry-leading Hilton Honors app, where Honors members can check-in, choose their room, and access their room using a Digital Key. In celebration of the recent opening, the property is offering 1,000 Bonus Honors points per night until June 1, 2018. Embassy Suites by Hilton Seattle Downtown Pioneer Square is located at 255 South King Street, Seattle, Washington, 98104, USA. For more information or to make a reservation, visit embassysuites.com or call +1 206 859 4400. Embassy Suites by Hilton, one of Hilton’s 14 market-leading brands, is dedicated to delivering what matters most to travelers. The full service, upscale brand offers two-room suites, free made-to-order breakfast and a nightly two-hour reception with complimentary drinks and snacks. Both leisure and business travelers looking for a relaxed, yet sophisticated experience will feel right at home with brand-standard amenities like inviting atriums and complimentary 24-hour business and fitness centers. Embassy Suites by Hilton has 245 hotels with 47 in the pipeline. Hilton Honors members who book directly through preferred Hilton channels have access to instant benefits, including a flexible payment slider that allows members to choose nearly any combination of Points and money to book a stay, an exclusive member discount that can’t be found anywhere else, free standard Wi-Fi, and digital amenities like digital check-in with room selection and Digital Key (select locations), available exclusively through the industry-leading Hilton Honors app. For more information, visit http://www.embassysuites.com or news.embassysuites.com. Connect online with Embassy Suites by Hilton at Facebook, Twitter and Instagram.